Classifications are to departments what the pre-defined categories are to accounts—they are used to group related departments together for reporting purposes. A department can be associated with one classification, and this can be altered at any time. 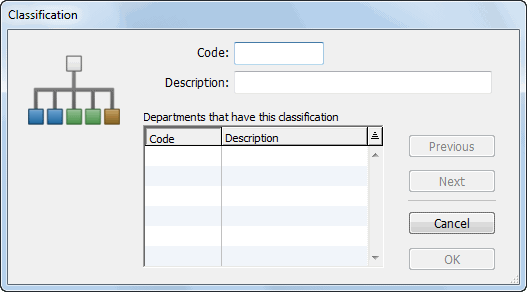 The Classifications command in the Show menu displays a list of all the departmental classifications set up for your system. If none exist, the list will be empty. The list of classifications in your system will be displayed. The Classification entry window will be displayed. This may be a maximum of 5 characters in length—characters can be alphanumeric—letters are automatically capitalised and spaces are converted to underscores—the “@” character is not permitted. Classifications can only be assigned to Departments in the Department entry window — see Adding a new Department. Once assigned the codes and descriptions of the departments assigned to a particular classification appear in the scrolling list at the bottom-left of the Classification entry screen. Modifying a Classification: You can change the details of a Classification at any time by double-clicking on its record in the Classification list window.